“It was a good opportunity to get through medical school faster,” Dr. Keeley Hobart, who joined a federally funded program that allowed her to finish medical school one year early and receive a scholarship equal to a full year of tuition, said. Not long after Keeley Hobart started medical school at Texas Tech University in 2011, she joined a federally funded program that allowed her to finish school one year early and receive a scholarship equal to a full year of tuition. The caveat: the program's curriculum focused exclusively on preparing medical students to become family physicians, one of the lowest-paid specialties in medicine. For Hobart, the decision to apply for the program was easy. She always wanted to be a family medicine doctor. “It was a good opportunity to get through medical school faster,” she said. Texas Tech's admissions officers look for students for the Family Medicine Accelerated Track who eventually want to practice in small towns, which face a shortage of qualified doctors willing to locate in their communities. The FMAT program has graduated 31 students since its inception in 2011. All of the graduates have begun or completed residencies in family medicine, but not all have gone on to serve in rural communities. That's true for many of the academic physician-training programs created in recent years to bolster primary care. Experts say there are several reasons hampering the government's efforts to increase the ranks of new physicians entering primary care and family practice. The financial burden of carrying staggering student debt pushes many new doctors toward higher-paid specialties. That's reinforced by a culture in medical schools that still encourages specialization, which often takes longer training, attracts the most ambitious students and holds greater societal prestige. Medical schools, sometimes with assistance from federal funds, have launched initiatives to encourage students to pursue a specialty in primary care. But factors outside the control of administrators are channeling students in other directions. Boosters of the programs to train more primary-care physicians argue that other specialties need to care about the looming shortage. “You can't do all the other (specialties) unless you have primary care,” said Dr. Atul Grover, executive vice president of the Association of American Medical Colleges. But those formative educational experiences of being exposed to primary-care settings while in medical school aren't the biggest influence on the ultimate choices of medical students. An AAMC survey showed (PDF) individual personality and role models were far more significant factors when it comes to the eventual specialty choice. The most successful primary-care training programs, Grover said, identify students who already know they want to be primary-care physicians when they start medical school. Those showing the most interest often come from rural communities. The Texas Tech FMAT program was funded by a five-year, $1.5 million grant from the Health Resources and Services Administration. Since 1999, the HRSA has provided more than $9.4 billion in grants to medical schools and other organizations that aim to increase the ranks of primary-care providers and other healthcare professionals in underserved communities. The HRSA also offers loans to students who complete residency training in primary care as well as scholarships for young doctors who join the National Health Service Corps, which places primary-care and other physicians in areas of need—much like a domestic Peace Corps. The agency has partnered with states on loan repayment programs for primary-care providers who serve in federally designated shortage areas. The persistent effort led about 72% of medical schools to create programs encouraging students to enter primary care by 2014, up from 49% in 2009, according to a 2015 survey from the AAMC (PDF). The schools hope the programs will help alleviate an expected shortage of roughly 12,000 to 31,000 primary-care physicians by 2025. Hobart is a beneficiary. She grew up in a small town not far from Texas Tech in Lubbock. 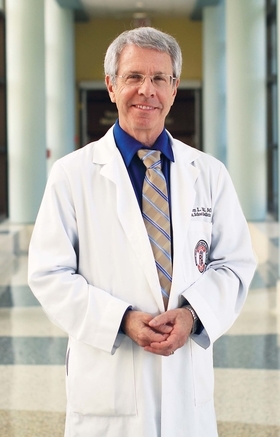 But her institution has “learned there is no way to predict with any certainty” which students will go on to serve rural patients, said Dr. Steven Berk, executive vice president and provost of Texas Tech's Health Sciences Center. “It's not that medical students want to be rich. But if you've got a debt of $200,000 after medical school, they may be enticed to choose another specialty that is more lucrative,” Dr. Steven Berk of Texas Tech University's Health Sciences Center said. The University of Maryland's Primary Care Track program has turned to mentoring by pairing students with primary-care physicians. At various points in their medical school education, students work alongside a physician delivering primary care to people in underserved communities in Baltimore and other low-income areas of the state. “Our not-so-secret mission is these students will fall in love with primary care,” said Dr. Richard Colgan, vice chair of medical student education and clinical operations for the family and community medicine department. The University of Maryland began the program in 2011 after receiving a five-year, $877,000 grant from the HRSA's Primary Care Training and Enhancement program. The program has awarded $14.5 million this year to support programs at 33 medical schools and hospitals. The first class of 35 students graduated in May, but only 75% chose residencies in primary care. Colgan acknowledges that some students changed their minds after graduating because they carry large student loans. Primary-care physicians earn significantly less than other specialties. On average, primary-care physicians earn $195,000 a year compared with $284,000 on average for other specialists. At the same time, median medical education debt (PDF) has increased by 6.3% every year since 1992. Nearly half, or 47.5%, of medical school graduates said income expectations influenced their decision when they decided a specialty. And 27% said loan debt influenced their specialty choice. “It's not that medical students want to be rich. But if you've got a debt of $200,000 after medical school, they may be enticed to choose another specialty that is more lucrative,” Berk said. “Our not-so-secret mission is these students will fall in love with primary care,” Dr. Richard Colgan of the University of Maryland said. 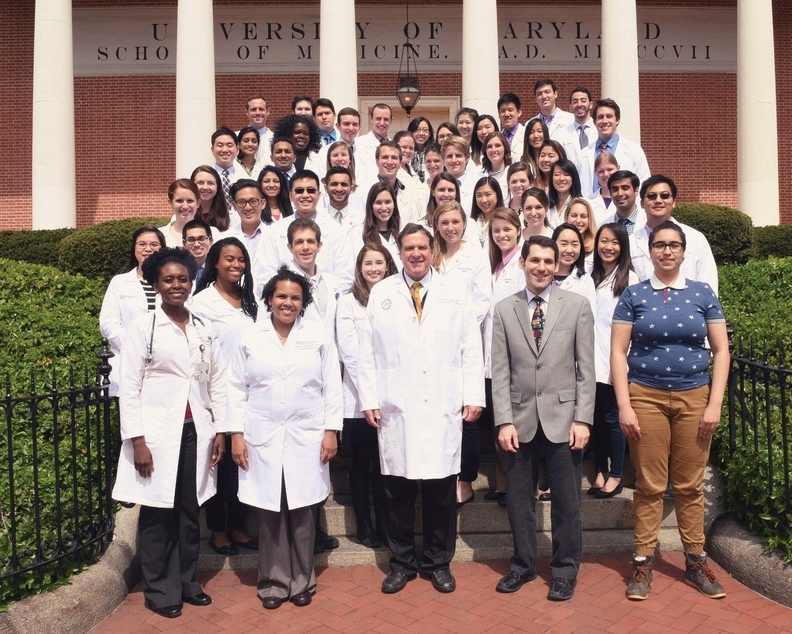 Colgan, center, poses with students in the Primary Care Track program at the University of Maryland. But debt isn't the only issue pushing students away from primary care. 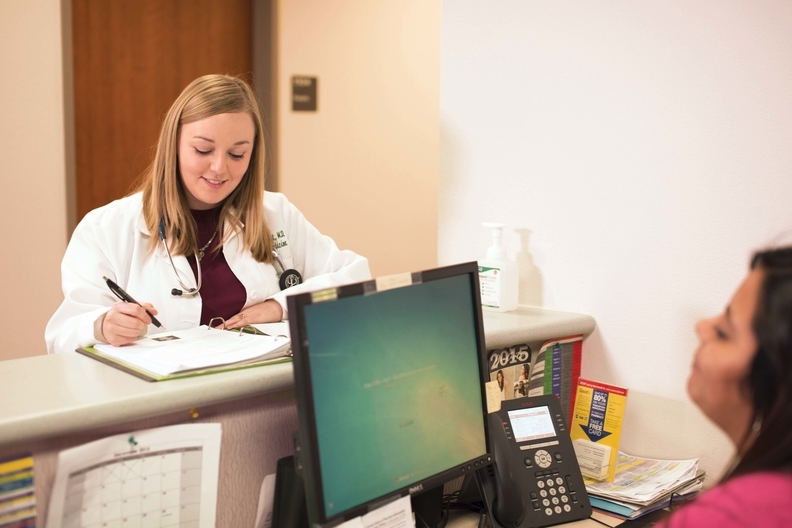 Depending on the institution, students can be told by professors and their peers that family medicine and primary care is “beneath them,” Berk said. Primary care often doesn't get as much respect as high-paying, competitive specialties such as orthopedics, he added. Berk said the culture at Texas Tech has shifted since the FMAT program began. The students in the program are well-respected by classmates and staff because of its “rigorous” three-year curriculum, he said. At Duke University School of Medicine, attitudes toward primary care changed after the institution implemented its Primary Care Leadership Track program in 2011. Similar to most medical schools affiliated with a tertiary hospital, students weren't going to Duke to study primary care, said Dr. Barbara Sheline, director of the program and assistant dean of primary care. The program is small, with only eight students enrolled each year. Interest in the program has increased dramatically, however, with about 325 students applying to the program every year. Sheline said she has made it a priority for the students enrolled in the program to be ready for the future of primary care. Duke pairs the enrolled students with primary-care providers in Durham, N.C., a city of approximately 290,000 with a diverse population of uninsured and underinsured residents. The students work in groups to prepare for a team-based approach to healthcare. During their third year, they are required to complete a population-health project that addresses a healthcare issue in the community. She said she hopes the students will become “change agents” in healthcare. “If you put students with staff who are going to support them and (tell them of) the exciting world primary care will be, students can and will be excited,” Sheline said.